Welcome to Season 1, Episode 5 of the Canadian Immigration Podcast. 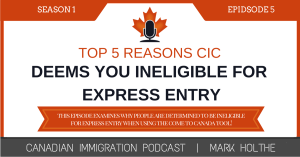 In this episode I will be discussing my Top 5 reasons you are deemed ineligible when using the “Come to Canada” assessment tool for Express Entry. This podcast is dedicated to all of you who have tried to complete the CIC “Come to Canada” tool that is a prerequisite to applying for Express Entry in Canada, but have been found ineligible. Sometimes, your background is not quite what it needs to be in order to qualify. However, in other circumstances, your ineligibility arises because of an error on your part in how you answered the questions within the Come to Canada tool. Your language test is invalid. You don’t have enough skilled work experience. You don’t have sufficient funds. You do not meet the minimum qualifications under one of the 3 Economic Programs. You have problems with your personal reference code (this is really post eligibility; however, you can consider it a bonus tip). 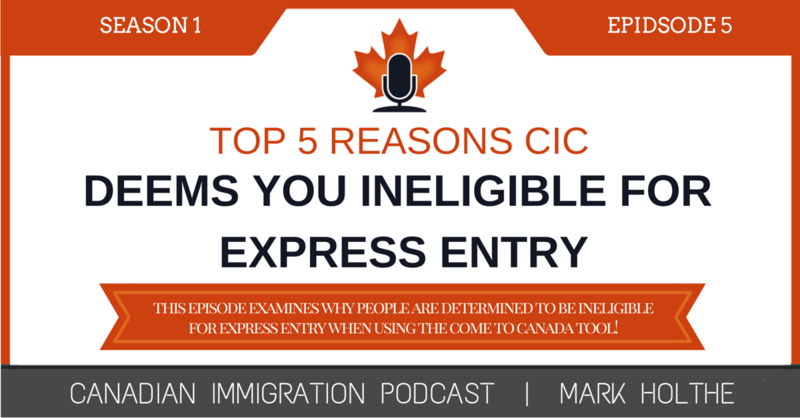 The 5 most common reasons people are found ineligible for Express Entry. How to navigate CIC’s “Come to Canada” tool. Great links to essential CIC resources for determining your eligibility under Express Entry. Helpful tips on navigating the complex Express Entry process. What to do if you don’t have your settlement funds and need help from family. I will be speaking at the follow upcoming event. If you would like to register, please follow the links below for further information. Let me know if you will be attending as I would love to meet you in person. You can read a additional notes for this episode, [spoiler]Welcome to the Canadian immigration podcast season 1, episode 5. TIP: remember you enter your actual scores from your test, NOT the CLB conversion totals. TIP: it asks for your Skilled Work Experience IN CANADA – you need to understand which skill level applies to you. Have F/T Offer of Employment for 1 year OR certificate of qualification from a Province or Territory. I have been granted an ITA through Express Entry and the portal is asking me to provide proof of funds. I know I don’t have enough to cover myself, my wife, and my 2 children. Can I borrow money from my father to provide the “show money”? Answer: If you are receiving money, it must be an irrevocable gift and not a loan. If you have a large deposit within the previous 6 months, you simply need to explain where the money came from, this will be critical. Maybe you sold a house or other possessions to obtain the settlement funds. Key Suggestion: try to save money in advance and have it in your account over a period of 6 months. If money is obtained from family, it has to be an irrevocable gift to you. May sure that you provide an affidavit or other document confirming that your family provided you with the money and does not expect it to be paid back. Always include a letter explaining where the funds came from. TiP: if you have sufficient funds in one account, you don’t need to submit letters for all of your accounts. Tip: You can NOT use property valuations as proof of funds. The property would need to be sold and the funds available in your account. Tip: You can also NOT show borrowed funds, so loans are out.